Three generations of improvisors come together to forge “beautiful alchemy,” and the gold is captured on this 2018 studio recording from London’s Rare Noise. Dave Liebman is a jazz saxophonist who was mentored by Elvin Jones and Miles Davis in NYC in the 70s before going on to perform in many other groups, including his own ensemble. Adam Rudolph is a prolific percussionist (see his collaborations with Yusef Lateef and the group Hu Vibrational), specializing in jazz and African drumming styles. Tatsuya Nakatani, another percussion wizard, tours like crazy across the US, performing solo, with collaborators, and with his own Nakatani Gong Orchestra. The Unknowable showcases each of the artists’ strengths over 13 concise tracks. Rudolph’s lively hand drumming lends a natural, organic quality, while Liebman’s warm saxophone and flute melodies match the others’ quick rhythms, or lengthen in broad tones to add contrast. Nakatani’s textures – metallic, electronic, dark, untamed – make the more traditional elements feel modern. 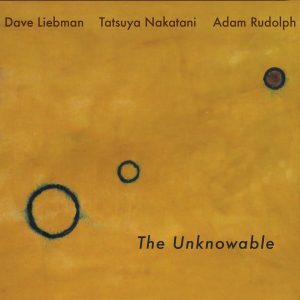 Some pieces find the artists experimenting with unusual instrumentation – Liebman plays the Fender Rhodes on “Iconograph” (T10), and transforms his saxophone with spectral electronic effects on the title track (T4), and Rudolph plucks the keys of a thumb piano on the peaceful “Distant Twilight” (T9). This is challenging – but never difficult – material, and altogether a genre-less, generous, and enjoyable album.